Vertigo Gaming Inc. had the pleasure of attending PAX East 2018 in Boston, Massachusetts. It was pretty cool. Attending PAX East was kind of a huge deal for us for a whole cacophony of reasons. Firstly, it was our first time at PAX East! 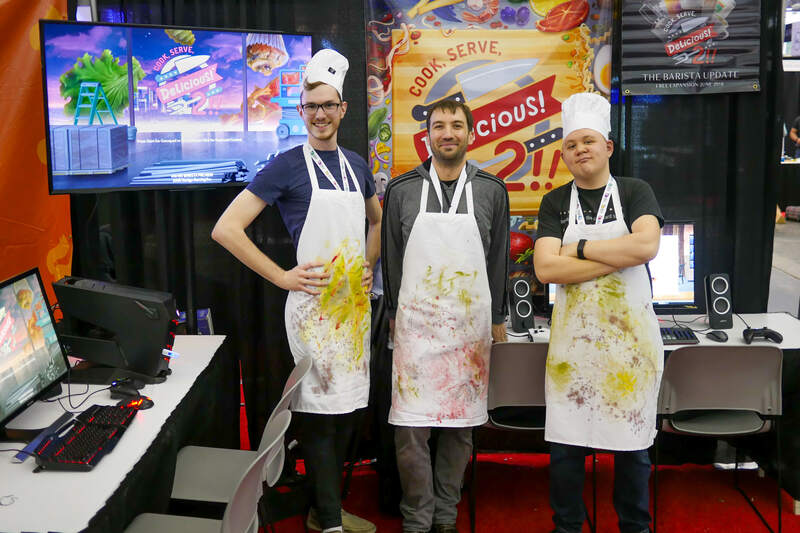 That means all you lovely folks on the east coast who couldn’t check us out at 2017’s PAX West got to stop by our booth, say hello to our friendly faces, and try out our latest game, "Cook, Serve, Delicious! 2!!" On top of that, it was our first time being invited to attend by the Indie Megabooth, which was a huge honor. 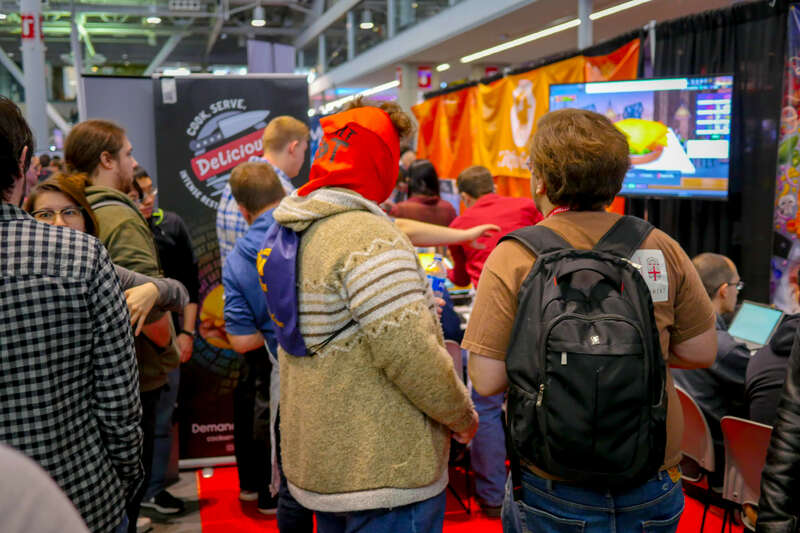 Going to PAX East was also a big deal for Cook, Serve, Delicious! 2!! itself. For one thing, this was the first event where we got to show it off post-release. That means not only was the whole game playable and in working order, but we got a chance to talk to actual, real-life fans who played and loved the game, which is basically one of the most fun things to experience ever. Even cooler was that we got to show off a brand new, yet-to-be-released update to our CSD2 fans, as well as advertise the upcoming launch on PS4! Lastly, one of the biggest huge deals for us attending PAX East was that we got to meet each other in person for the first time, despite having worked with one another online for years! For those of you who don’t know, the Vertigo Gaming team are literally from all around the globe – spanning three continents, to be exact. Although David himself was unable to attend, Erik (Vertigo’s Business Development guy) from the Pacific Northwest of the United States, Nick (CSD2 Writer) from Australia, and Ryan (CSD2 Writer) from the midwestern United States were all brought together for the first time in beautiful Boston to hang out and promote this thing that we’ve all poured our hearts and souls into bringing to life. That in itself was a cool enough experience to talk about, but we know that’s not what you’re here for. 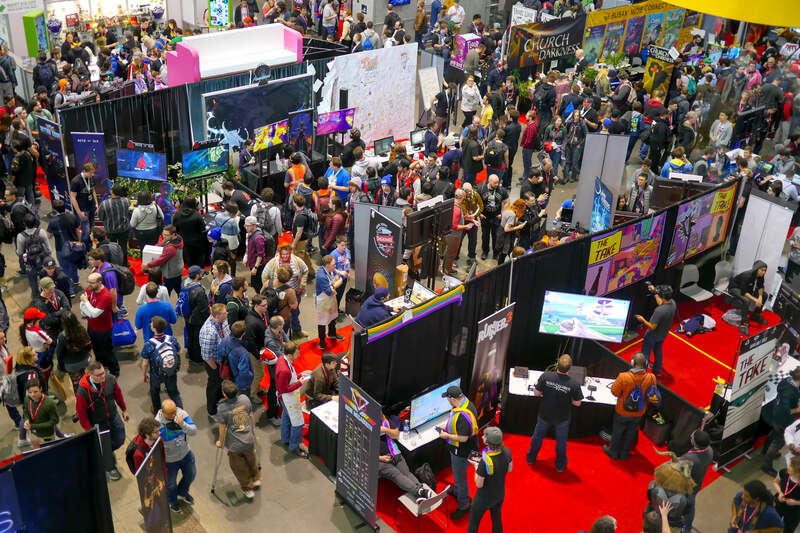 For those that don’t know, Indie Megabooth is a collective which buys out a huge, central space at game shows, allowing indie devs to be just as visible as the big guys. For us, this meant having a booth in an area which receives a lot of foot traffic and draws in a big crowd of indie game fans. What’s more was that we were fortunate enough to get a corner booth, which further increased our visibility! 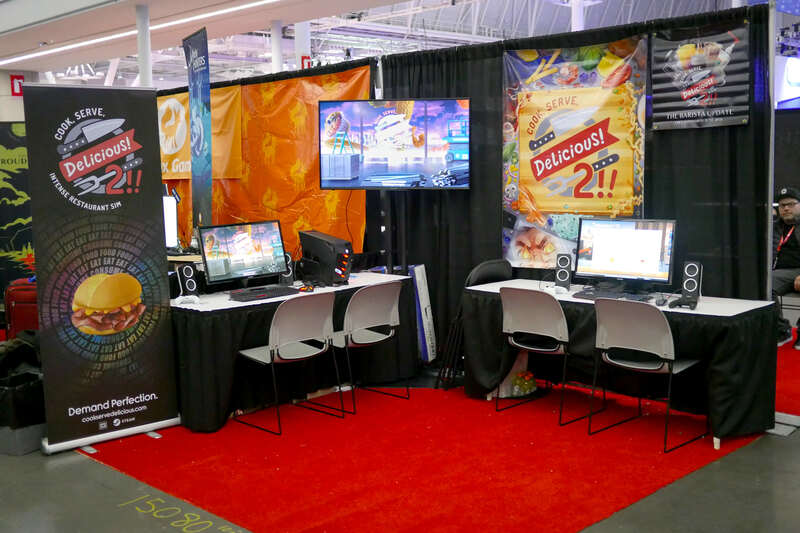 While we were immensely excited about our invitation from Indie Megabooth, it quickly set in as to what was expected from us in order to make a great booth, and we started focusing on how best to utilize our space. With only 10x10ft to work with, we knew we had to plan carefully. The best developers often create intricate 3D renders of their booth so they can best optimize their space, so naturally we set out to do the same. As you can see in our professional art render, our booth featured two stations where people could play CSD2, each of which had two chairs for friends, couples, and families to play co-op mode. The TV in the middle was hooked up to one of the computers, showcasing CSD2’s chaotic rush hour gameplay to passers-by in real time. The most important aspect of our booth, however, was the open-concept layout. While some developers choose to have desks in the middle of their booth, in which players sit on one side of the desk while the developers sit on the other, we felt it was important to create a very accessible and inviting atmosphere. This allowed us to casually mingle with players and give off a more welcoming vibe to people passing by. As far as equipment goes, larger items like computers and TVs were rented through PAX, while smaller items such as chairs, posters and cables were shipped to us direct from David in Texas. These included a combination of items bought specifically for the event as well as old odds and ends from David’s personal collection, including an HDMI cable blatantly taken from his Nintendo Switch. The largest of David’s deliveries, however, were the 1,100 bags of swag that he painstakingly put together over a two-week period. 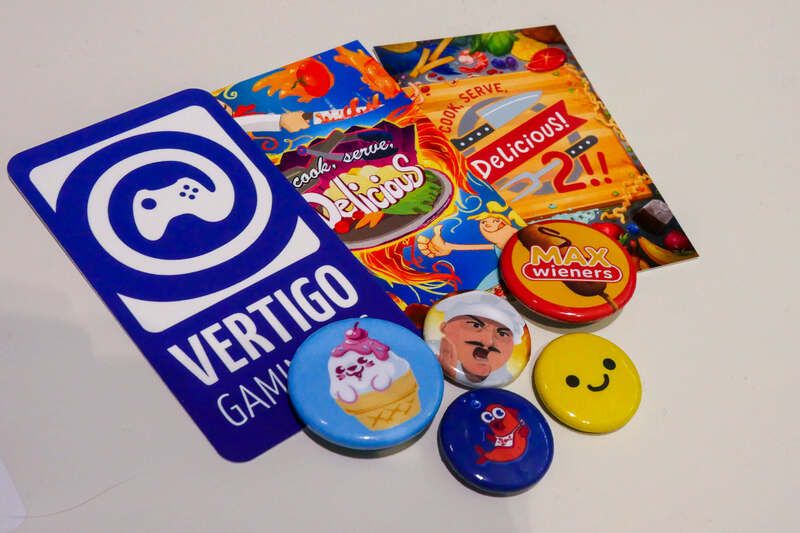 Each bag contained three cards and five pins featuring artwork from the game. These swag bags were available to attendees for free, however, we made a point of only giving them to people we had a conversation with or who played the game so as to maintain their value to the fans. With everything set up, we only had one more thing to deal with: outfits. David had the wild idea of making us wear chef hats and aprons that he would decorate with paint and dye to give the appearance that we’d just finished a long day in the kitchen. Though originally envisioned as a gag, it later clear that the outfits were an accidental stroke of genius. With so many people at PAX East, some booths had an issue where attendees struggled to tell the difference between the developers and the players. Luckily for us, the chef outfits ensured we avoided that completely (with the exception of a small period of time where some Overcooked cosplayers turned up). As far as CSD2 fans went, a good number of players knew knew to expect us and sought us out to check out the new Barista Update content. These folks were amazing, and talking to them was almost like having a reunion with friends that you’ve never met before. We often ditched the normal showfloor rhetoric and just chatted with them; after which they would hop on the keyboard and typically DESTROY a round of the game – impressing everyone gathered around the booth and displays. One especially noteworthy individual was Samantha, who ran through the new Barista content without a single mistake! That was a particularly impressive feat, as the Barista Update was proving to be tough even to veterans of the series. We were only showing three new foods in the build (along with cookies and fruit salad as the sides), but they came together well and demanded an expert combination of speed (espressos brewing / burning up) and precision (picky Hot Latte and Smoothie orders) that proved challenging to most players that were bold enough to take on the new content. On the other hand, CSD1 players that weren’t aware of CSD2’s existence were treated to a pleasant surprise when they happened upon the booth. As one might expect, the holding stations mechanic in CSD2 was completely new to them and they often had to be taken through the relevant tutorials, but after that, they were in good shape to take on the first Max Wieners menu with little trouble! 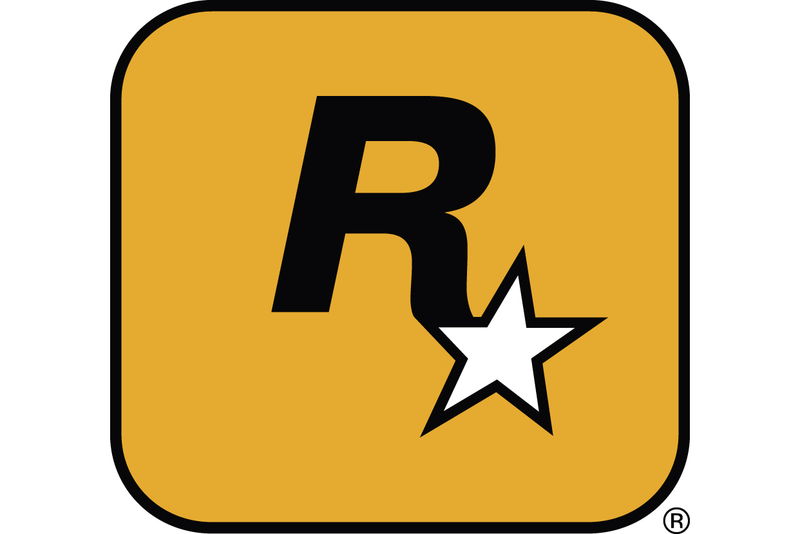 Included in both of the first two types of attendees were fans of the games’ development team itself. It felt like 1 in every 10 people we talked to asked “Is David here?” or some sort of variation of that question. Many were over the moon to get a chance to meet the primary writers Nick and Ryan – often taking the chance to tell them how above and beyond expectations that portion of the series has gone and what it added to the overall experience. The last group (those unaware of CSD’s existence) was naturally the largest in number, and where we knew our work would be cut out for us in terms of pitching the game and providing instructions on how to play. Our voices threatened to leave us on more than one occasion throughout the weekend thanks to these folks, but it was well worth the sacrifice to ensure an awesome experience for everyone that took the time to stop by and (in many cases) wait in line for a good amount of their limited PAX East floor time to play our game. PAX East attendees that hadn’t heard of us also provided good motivation; as broadening the CSD series’ fanbase was just as important (if not more so) than connecting and reconnecting with people that fell under the former two categories. Another amazing thing about our audience was its diversity. It’s no secret that the majority of gamers, generally speaking, are young men. This is why it was so pleasantly surprising as the hours and days progressed to realize that CSD2 transcended that limited demographic to appeal to a much wider audience. Throughout the week, CSD2 attracted people both old and young, male and female, across every ethnicity. 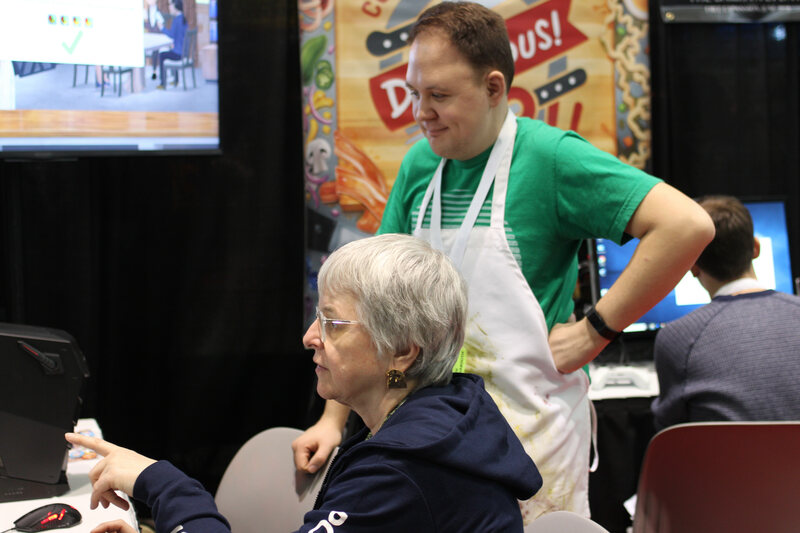 We had mothers come to play co-op with their sons, fathers interested in trying out the game that their daughter was obsessed with, and an older woman who was an actual professional chef! Not only was it a bona fide melting pot of fans, but everyone was delightful and had an incredibly positive reaction to the game! There were few things quite as satisfying as watching someone’s eyes light up as we told them they could design their own restaurant in the game, or witnessing best friends and couples playfully bicker and strategize as they tackled co-op mode for the first time. Outside of PAX East itself, everything else about the experience was great! There were a few hiccups with some of our flights, but we all arrived safely and with enough time to not pull our hair out. The weather wasn’t exactly hot and sunny, but we didn’t have to bundle up into thick winter coats to stay warm, and we were inside the convention center for the worst weather anyway. 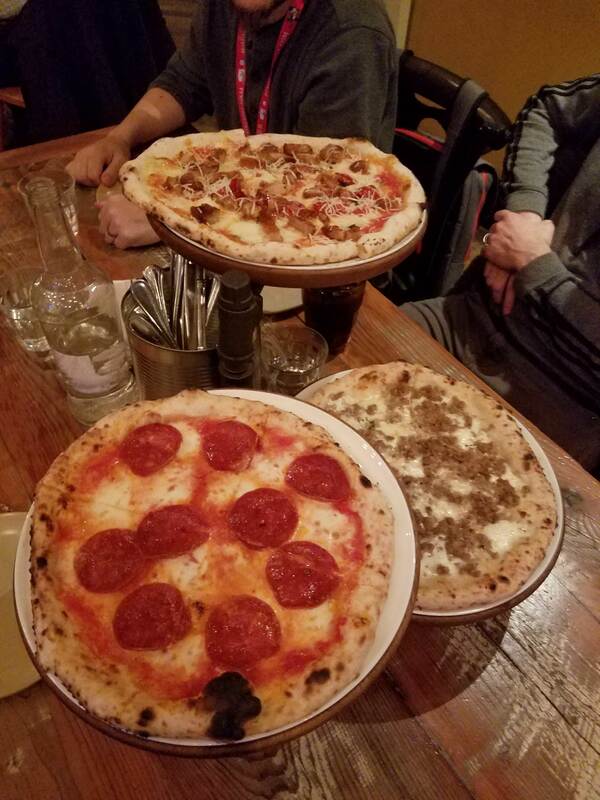 We also managed to find some really great local places to eat for most of our dinners! It was also just a lot of fun to be around so many like-minded people. Not only did the three of us get along really well considering we’d essentially just met, but we got to hang out with some other great indie devs from all over the place. These included the lovely folks over at Kitfox Games, who were our booth neighbors for the week, the wonderful group from Robot Loves Kitty, with whom two of us had the pleasure of going out to dinner with at a really, really delicious pizza place (see photo above), and the delightful fresh-on-the-scene devs at Big Sir Games, with whom we also enjoyed a dinner with and for whom CSD was a huge influence on their game (check it out – it’s so much fun!). One thing that was made abundantly clear to us in the first couple of days was that many attendees (especially the relatively high percentage that had played CSD / CSD2) were ready and willing to purchase our games and/or related merchandise. Unfortunately, we didn’t have any of that on hand. While selling anything on the show floor would have added several challenging factors to consider, such as dealing with different state tax laws, handling money, and managing inventory, we could have mitigated at least some significant percentage of the show’s total cost if we would have come up with a feasible strategy for selling copies of our games as well as posters and plushies. 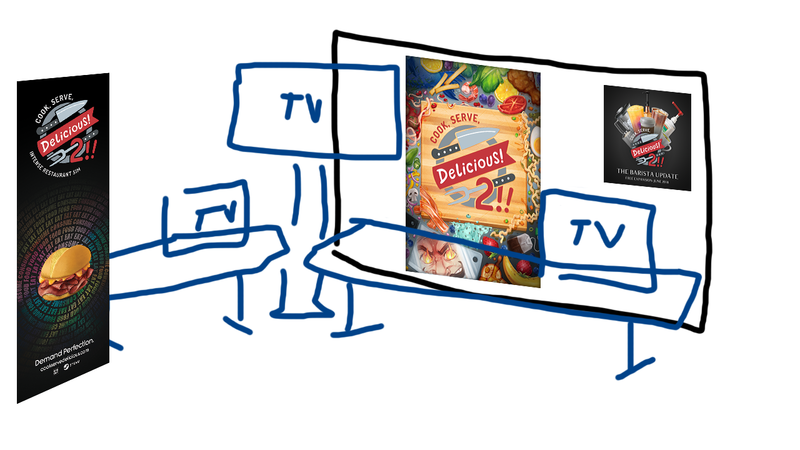 Another issue was with our big display TV. It was the right idea for us overall, but since it was connected to one of our PC stations there were many stretches of time when we were stuck displaying lackluster bits of the tutorial that failed to attract the interest of as many people as the core gameplay did. Because of this, a looping video showing off all the exciting bits of the game might be better for next time. 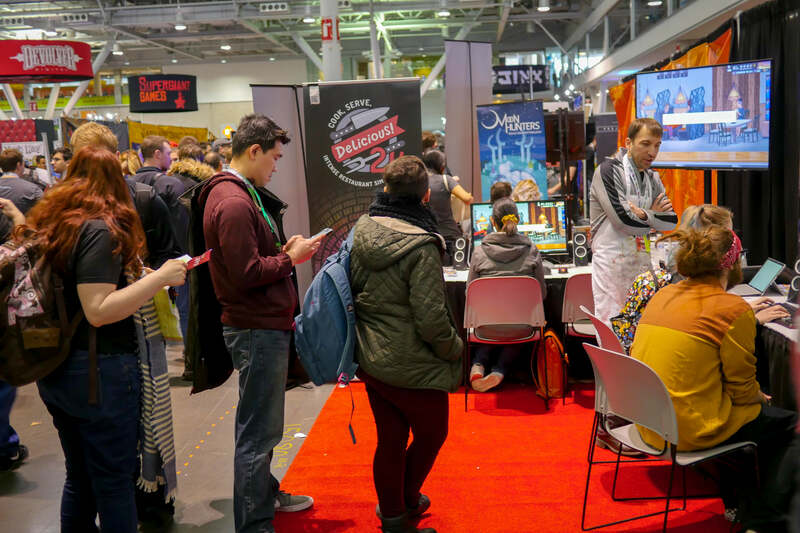 So, what should first-time developers be prepared for when appearing at PAX East? Well, firstly, it’s important to consider the financial demands associated with attending such an event. For each person, you have to consider the transportation and lodging costs. To fly each of us out (and back) and put us up in a hotel for six nights cost about $2,000 per person, though some of that could be mitigated by staying in a hostel or an Airbnb. It also cost us $600 for all the signs and posters, $1,500 for the 1,100 bags of swag, and all of that was on top of the $2,600 cost for the space itself, which included computer rentals, desks, power, and so forth. Oh yeah, and people need to eat. Also, when considering the financial impact, keep in mind that we offered both CSD games for 25% off during the entire week of PAX East and we didn’t see any visible spike in sales aside from the standard increase of purchases that are typical during sales – we 100% expected this going in. Trade shows will not immediately boost your sales. You’re going for the exposure; to make new connections and fans, as well as to interact with the existing fans so as to keep yourself on their mind in a positive light. Second, it’s best to have at least three people working the booth. This might sound excessive, but you need to be able to give one another the chance to take a break while simultaneously being able to juggle press, players, and passers-by. It’s also important to remember that you’re a human talking to other humans. Having a pitch memorized is fine, but it’s important to read the person you’re talking to and tailor what you say to them. Some people won’t want to be bombarded with facts, while other people will ask you loads of questions. Similarly, make peace with the fact that not everyone is going to be interested in your game. Some will just want to watch. Others will play a bit and realize it’s not for them. That’s okay. It’s always better to spend time with the people who are already interested than to try and win over someone who isn’t at all. Finally, be prepared to go with the flow. Unexpected things will happen, and being able to deal with them will make for a much more enjoyable experience. Overall, attending PAX East was a phenomenal experience that (fortunately) went really well for us! The indie gaming industry is huge and full of tons of incredibly talented people, and it was really an honor to be among them. We can’t wait to get a shot to do it all over again!